It's DEFINITELY worth the wait! Thriller fans, rejoice! It has finally been confirmed that 'Dukun' will be making its way to the silver screens after being banned for more than a decade. The controversial movie directed by Dain Said, is an adaptation of real life events surrounding a Malaysian politician, the late Datuk Mazlan Idris, and alleged witch doctor Mona Fandey. The high-profile case garnered nationwide attention back in 1993 due to its gory nature and the influential people involved. Although decades have passed, the story is still remembered up until today. Mona Fandey was later found guilty of murdering the politician and was suspected of practising black magic. She was executed in November 2001. The movie was mysteriously leaked on the internet earlier this year in February, so it’s a surprise that 'Dukun' will finally be getting its time on the silver screen. Datin Paduka Umie Aida is the star and plays the lead of the movie, a female bomoh named Diana Dahlan. Adlin Aman Ramli plays politician Datuk Jefri. Other local actors and actresses who will also appear in this horror-thriller are Namron, Faizal Hussein, Bront Palarae, Nadiya Nisaa, and Elyana. Umie Aida couldn’t be more elated following the news and told Harian Metro that the 12-year wait was worth it despite the fact that she has come to terms with the fact that the movie may never be screened in cinemas. “I was informed that the movie will be shown in theatres last week. Honestly, I wasn’t expecting it espescially after the film was banned in December 2006,” she told the Malay daily. Rojak Daily did a quick check on the movie showtimes to see if 'Dukun' is really coming to cinemas and according to our findings, you can watch it as soon as 4 April 2018 (Wednesday). We know a lot of you (including us) are looking forward to watching this movie, but just a head’s up: a lot of scenes have been cut out so the one showing in cinemas will be different than the one previously leaked online. 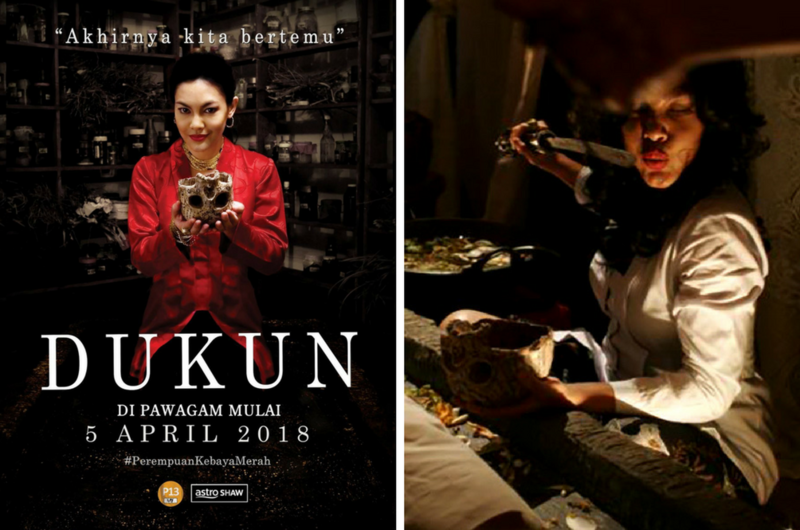 'Dukun' premieres in a cinema near you this 5 April 2018. Henry Golding Is Rumoured To Play The Next James Bond!